Summer's given way to September, and I've hardly noticed. I've been in a self-imposed writing exile for a while. It's necessary for someone like me who has the attention span of a gnat and the writing speed of a sloth. But now, the sun is shining, the temperature's dropped a good eleven degrees, and I'm finally ready to talk about what it is I've been working on. I'll start by admitting I'm not currently writing the second book of the Watermarked series. Yes, I know that was the original plan. I even went so far as to tell the world a planned publication date. Mistakes, I make a few. Honestly, I've not entirely given up on it, but I simply needed a break. It's a big book with a lot of big subjects, and it's draining to write. As my first foray into self-publishing, it taught me a lot. I wrote Watermarked for myself, which is a wonderful thing to do. But the thing is, writing's a lonely business when you're in it exclusively for yourself. That first book was, in many ways, too much. For the second book, I'm taking a different route. I've been a longtime reader of the fantasy genre, but I never thought I could write it. You have to have an imagination for that, right? I tried the traditional approaches (ie: "girl with magical powers" and "I want to be king, but he wants to be king, and no one's sure who should be king") but none of them felt like me. So I took the everything I loved, interjected them into the story, and hoped it would all work out in the end. The result is what you get when a literary fiction author tries to write fantasy. It comes across like a modern fairy tale. I'm calling it Stolen. The year is 1945. The city is London, bombed to hell by those persistent Nazi's. Ella, our heroine, is a promising student at the national ballet school. On her seventeenth birthday, she meets the quiet and mysterious Jesse Cohen when he transfers from Boston. They're paired as pas de deux partners. Though their relationship falters at first, they forge a friendship. Soon, they realize that their feelings aren't purely platonic. It's first love, in all of the gooey, all-encompassing, to the death ways that teenage first love is. Things are going well when Jesse suddenly vanishes. The police search for him, but find nothing. So Ella takes matters into her own hands. She finds a secret door in the attic of the school. Curiosity gets the better of her, and what begins as "only a quick peek" finds her following the passage behind the door until she reaches the end. It leads to an idyllic world - a far cry from the ruins of London. Upon arrival, she's greeted by a girl named Wren. Wren's a wild sort. She knows the ways of the forest and teaches them to Ella. She also tells her a lovely little story about a queen who resides in the mountain and has taken to stealing young boys for her own pleasure. Together Ella and Wren unravel the mystery of what happened to Jesse, but it's far from easy. Matters of the heart rarely are, after all. And there you have it. This one is coming in at around 200 -225 pages. It will be shelved under YA Fantasy and is pretty PG. 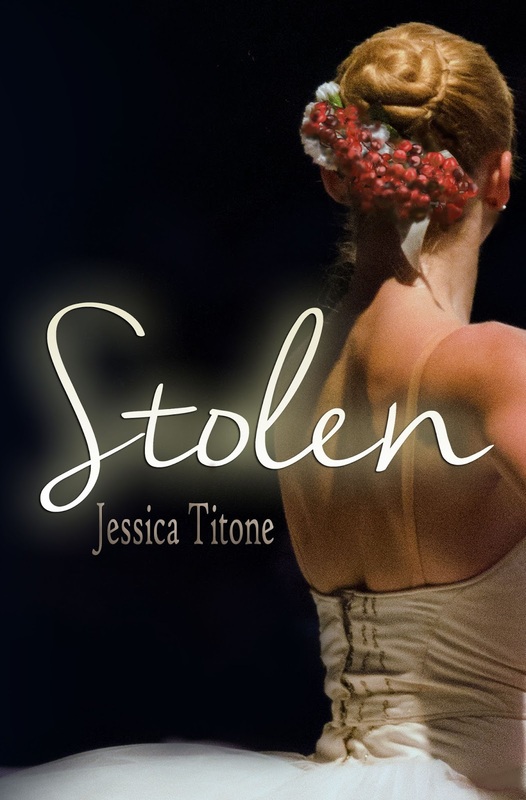 The Goodreads listing for Stolen should be debuting soon, so get your "Want to Read" button clicking fingers ready. As one good turn deserves another, the cover reveal is below.